Pizza is a go to food for many families. Kids love it, parents like it and its an easy dinner with minimal clean up. Since I am working so much we find getting Little Caesars Pizza on a night where no one wants to cook and we crave a great pizza is a good choice. My husband was telling me about what he heard was a Detroit style pizza where a deep dish style pizza has crispy sides and you put red sauce on top of the pizza. I told him I think that is exactly what the New DEEP!DEEP! Little Caesars pizza is. We headed to our favorite local Little Caesars to try the New DEEP!DEEP! pizza. We also ordered some bread sticks with dipping sauce. Little Caesars new DEEP!DEEP! Dish pizza featuring 8 caramelized corner slices that delivers a crispy, crunch in every bite! That's a large, DEEP!DEEP! Dish pizza, HOT-N-READY everyday between and only $8 at Little Caesars! 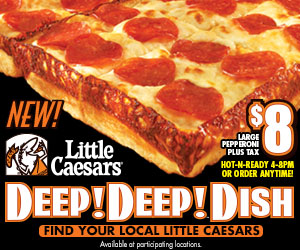 Stop by your local Little Caesars today and try the new DEEP!DEEP! Dish pizza! It's a traditional Detroit-style deep dish with more of the stuff you love: crispy corner crust, more cheese and more pepperoni! HOT-N-READY from 4 pm to 8pm and only $8 (+ tax at part. locations). Value! Value! We LOVE the DEEP!DEEP! pizza! I was surprised at the flavor. Its so soft and fluffy on the inside and has a crispy crust. We even put a little red sauce on top of the pizza giving it a wonderful flavor. Next time you are craving Pizza or just need a quick dinner to grab Little Caesars is a great option. We even grab a $5 HOT-N-READY Pizza on the way to the park a few times a month for a casual fun picnic. Little Caesars Pizza is hosting a Sweepstakes! ENTER!ENTER! For the chance to win FREE DEEP!DEEP! Dish pizza for a year. *Limited to US residents 18 years old and above. Giveaway starts May 16 2013 and ends on May 30 2013 at 12:01 am EST. Winner will be emailed and has 72 hours to respond before another winner is selected. I was not paid for this giveaway or post. The opinions on this item are 100% mine and may vary from others. The sponsor is responsible for providing the prize. I was sent a product to review for this post. I will share with my kids. Thanks! I would share my pizza with my family! I'd share my pizza with my husband and kids. My husband and 3 kiddos! I would share with the family. My family and even the dogs will get a bite. with the hub and kids! thanks for the chance! My little dyfunctional but funlovin' and happy family of 3!!! Share? Do I have to share? This sounds like a mom night at home alone after everyone is in bed! I will share it with my husband. I will share with my two grandchildren. They love pizza! I have a large family who will share with me. With my family. We live little Caesars. I share with my family. We'd have a pizza party. i might not share at all. bwahahahahahaha! i might hide in the closet and eat as much of it as i can, then hide the rest for tomorrow's breakfast! I would share with the fam! I have actually had it and it is REALLY good! My Husband and my kids! my family, if they can pry it away from me!!! I'll be sharing this with my family! I would share it with my nieces. They will love it! I'll share it with my husband - we just found out today that we're getting one near us! i will save this for my beach vacation and share it with my sister, brother, and boyfriend! I would share with my friend.